If you have a health condition or dental problem that prevents you from chewing and swallowing correctly, your doctor may have prescribed a pureed diet. You can use many regular whole foods as well as spices and other add-ins to create flavorful, filling meals. A nourishing diet in pureed form helps strengthen your body and provides nutrition in a texture and consistency that’s right for you. A pureed diet means that all food has been ground or processed into a smooth, paste, with a consistency that resembles a thick pudding. There’s an array of foods that are acceptable when following a pureed diet, but you’ll want to avoid foods that are stringy (like celery), foods with tough skins (like beans), hard cheeses, dried fruit, and nuts or seeds -- or foods that contain nuts or seeds. An effective way to puree foods is to cook any uncooked food until tender; chop all food into small pieces; add food to a blender or food processor with a small amount of liquid; and process until smooth. When following a pureed diet, it’s critical to make sure you’re eating enough, even if your appetite is not as strong as usual. You may need to eat six small meals -- or three small meals and three snacks -- during the day to make sure you’re getting all the nutrients you need. You can also incorporate milkshakes or high-calorie protein shakes between meals to help you meet your protein and calorie needs. 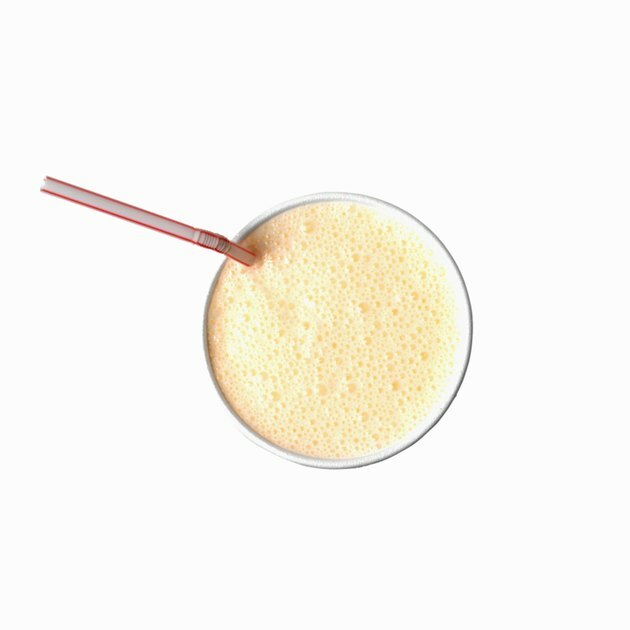 Protein shakes are a quick way to get all of the nutrients you need for a meal in one glass. The best part is, you can easily adapt protein shakes to your taste -- and you can drink them for breakfast, lunch, dinner or as a snack between meals. Sometimes shakes get a bad rap for being high in sugar, but when you do them right, you can make sure you’re getting fruits, protein, healthy fats and fiber all in one place. Start with seedless, skinless fruits like bananas and peeled apples and add some full-fat coconut milk or almond milk and a scoop of unsweetened protein powder. Thicken the shake -- and boost its fat and calorie content -- by adding a couple slices of avocado. You can also adapt the shake to your tastes by adding spices like ginger, cinnamon, nutmeg or unsweetened cocoa powder. Run the blender until all the ingredients are smooth and you’re left with a completely pureed beverage. Mashed potatoes are a staple on a pureed diet, but you can increase the nutrition content of this go-to side dish by combining some sweet potatoes, butternut squash and carrots with white potatoes. First boil the veggies; then put them in a food processor with some coconut milk, butter and seasonings and pulse away. The addition of orange veggies provides beta-carotene, an antioxidant that protects the body from free radicals and plays a role in healthy vision, and the butter increases the calorie and fat content. If you want to increase the calorie content even more, you can use heavy cream in place of coconut milk and add some cream cheese or sour cream as well. When you’re on a pureed diet, getting enough calories can be a challenge, but it’s important to get as close to your calorie needs as possible because your body will use that energy to help with the healing process. Avocados are a good way to boost calorie intake. They’re not only rich in calories -- 1/2 cup of pureed avocado offers 192 calories -- they’re loaded with healthy fats, and they’re a rich source of potassium. Avocados also contain a small amount of protein. Make some guacamole by combining two avocados, one tomato, some lime juice, salt and pepper in a food processor and pureeing until smooth. You can eat the guacamole alone or use it to increase the calorie count of any meal. Protein-rich purees are a key component of a pureed diet, especially if you're trying to recover from a medical procedure or health condition. You can make meat purees by chopping meat into small pieces and adding it to a blender or food processor with beef, chicken or vegetable broth. Just 1/2 cup of chopped chicken breast contains almost 22 grams of protein. You can also get protein in your diet by running full-fat cottage cheese through a food processor until it has a smooth consistency. A single cup of cottage cheese contains 23 grams of protein. You can up the protein (and calorie) content of cottage cheese even more by adding in a small amount of unsweetened protein powder while processing. Purchasing commercially-prepared pureed food is often not as cost-effective as making your own, but sometimes the convenience outweighs the expense. Baby food is not only already in pureed form, it offers balanced nutrition that takes the guesswork out of preparing your meal. Put together a balanced plate by choosing a meat, a vegetable, and a fruit. Depending on your size, you may have to double up on the jars to meet your calorie needs.